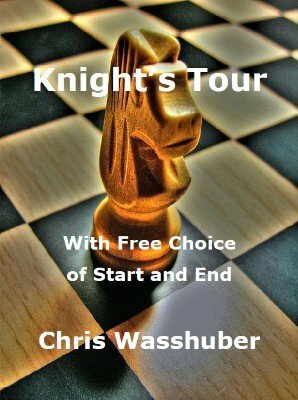 In the late 1980s I developed a method for the Knight's Tour which allows a spectator a truly free choice for the starting square and ending square of opposite color (same color start and end is mathematically impossible). This manuscript describes in detail this method. The method attempts to minimize memorization and teaches you a system to derive a proper complete tour on the spot. The method is so flexible that you can find several different tours for one pair of start and end points. Of course, there is some memorization necessary. The method makes it straight forward and practical to derive a complete knight's tour even under high pressure situations. It is also the only method published which truly allows you to perform this blindfolded without any sight of the chessboard. It would be wrong to say this is an easy method to learn, but it is definitely achievable for anybody of average intelligence. If you can memorize a stacked deck of cards, you should be able to learn this method. My method takes an 'impossible' feat and brings it down to a manageable level of difficulty. Bonus: Bob Cassidy contributed a fantastic idea which eliminates all memorization! A classic Cassidy idea. My experience is that the effect on spectators is more sophisticated than the one of a giant memory performance. A giant memory is impressive but it is sometimes belittled as "well, he has a good memory". This knight's tour conveys more an effect of incredible logic or mathematical skill than simply a good memory. I have guarded this secret for two decades. I hope it will bring as much joy to you as it has to me. 1st edition 2009; 17 pages.